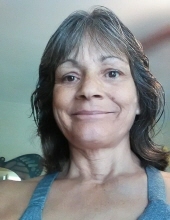 Norma Jean Wilson, 53, of Fieldale, VA passed away Sunday, November 18, 2018 at her home. She was born October 12, 1965 in Rhode Island to Robert Wood and the late Virginia O’Bryan Wood. In addition to her father, she is survived by her children, Kayla Favre of Reidsville, NC, Jason Wilson of Bassett, VA, and Samantha Hatcher of Ridgeway, VA; sisters, Lorie Pinalt, Tina Wood, and Maryann Wood; and brother, Raymond Wood. Also surviving are grandchildren, Ryan Favre, Keirra Favre, Faith Wilson, Lillian Waller, Emilee Wilson, and Katie Hatcher; and her six fur babies. A memorial service will be held at 2 p.m. on Friday, November 23, 2018 at Norris Funeral Services, Martinsville Chapel with Pastor John Heiss officiating. Norris Funeral Services, Inc. and Crematory of Martinsville, VA is serving the Wilson family. To send flowers or a remembrance gift to the family of Norma Jean Wilson, please visit our Tribute Store. "Email Address" would like to share the life celebration of Norma Jean Wilson. Click on the "link" to go to share a favorite memory or leave a condolence message for the family.